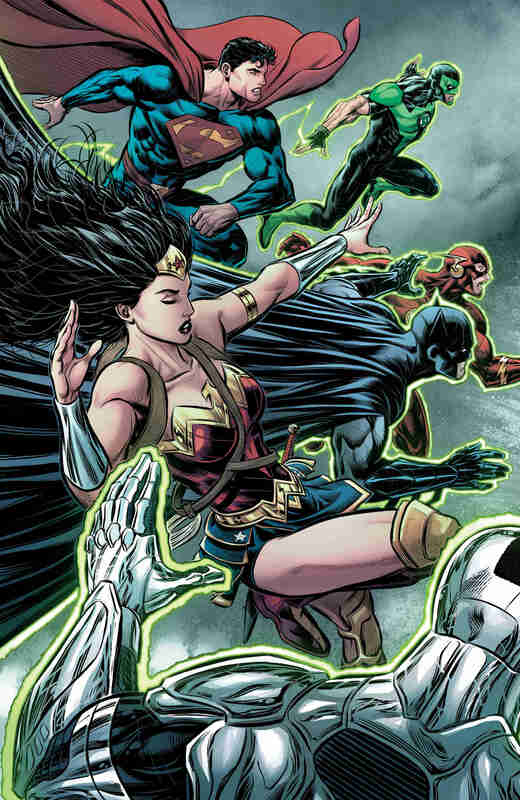 This latest standalone issue of Justice League is a classic superhero crossover punch-up that might not blow you out of the water, but is certainly entertaining enough. The generally underwhelming Justice League isn’t really anyone’s favourite DC Rebirth comic, but one book that has received a lot of acclaim is Dan Abnett’s run on Aquaman, which has dealt with Arthur’s struggles with being king and surviving the heated world of Atlantean politics. 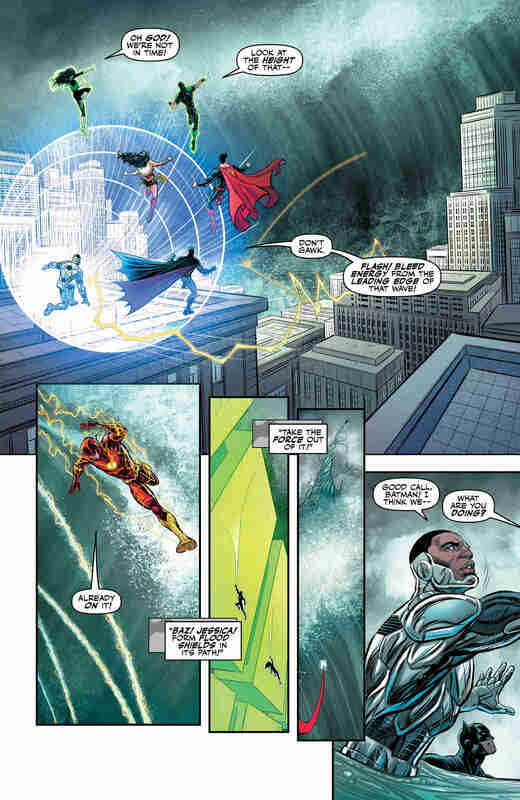 For his guest spot writing this Justice League issue, then, it’s no surprise that Abnett borrows from his Aquaman playbook. However, Arthur Curry himself doesn’t make a single appearance. 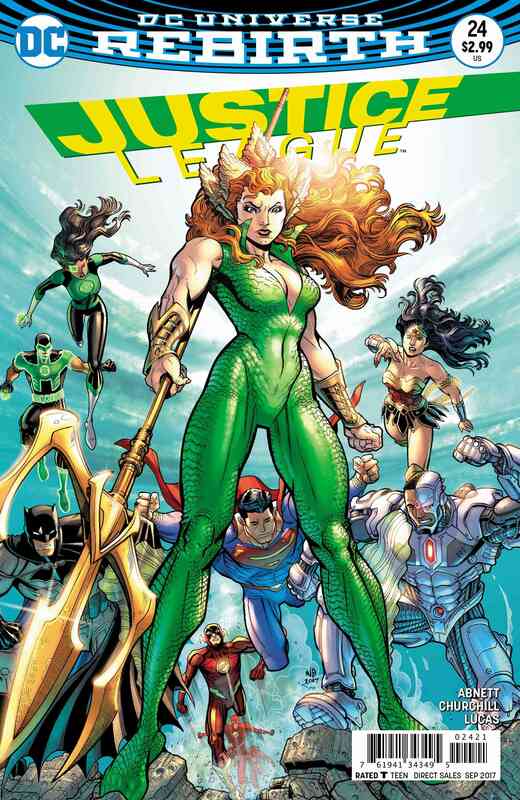 Instead, the focus is on Arthur’s wife Mera and her own encounter with the League. As readers of Aquaman #24 and #25 will know, the throne of Atlantis has just been usurped away from Aquaman and Mera has been torn away from her husband. 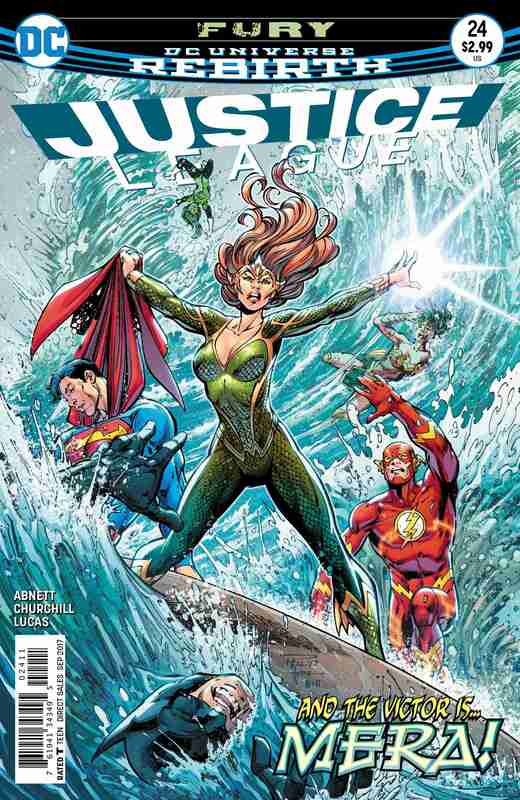 In this issue, the League go to Atlantis to stop some massive tidal waves that could destroy the East Coast. It turns out the cause is an irrational, emotional Mera who goes on to best each of the League in combat – yes, even Batman. 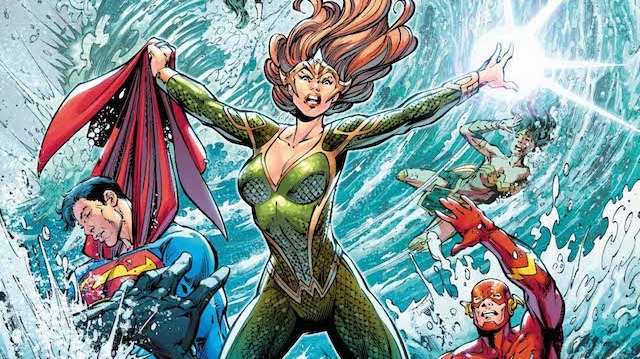 Mera fans might be in two minds over the former Queen of Atlantis’ appearance here. On the one hand, she’s put at centre stage for once and is able to take down all of the Justice League, which is one seriously impressive feat. On the other, she puts millions of lives at risk due to her own thoughtlessness. 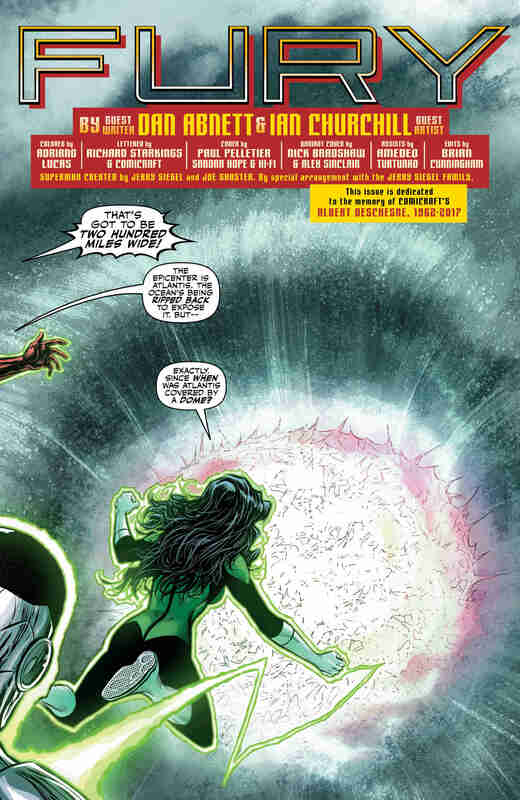 Obviously, it all turns out all right in the end once Mera realizes what she nearly did, but it’s a shame Abnett couldn’t think of a way for the plot to work without it casting back negatively on Mera. Likewise, it’s weird that the League so quickly wave away this narrowly averted mass-slaughter and let Mera join the crew. If you have issues with the writing, though, then at least Ian Churchill’s art is terrific. His rendering of each character is great – in particular, his Mera is a true warrior queen, looking both majestic and badass. Churchill is also a dab hand at page-long splash panels (splash being the operative word in an issue set at sea). The opening double-page spread of the six Leaguers jumping into action above Atlantis is excellent and there’s a moving one of the League showing Mera the view of the Earth from Watchtower. 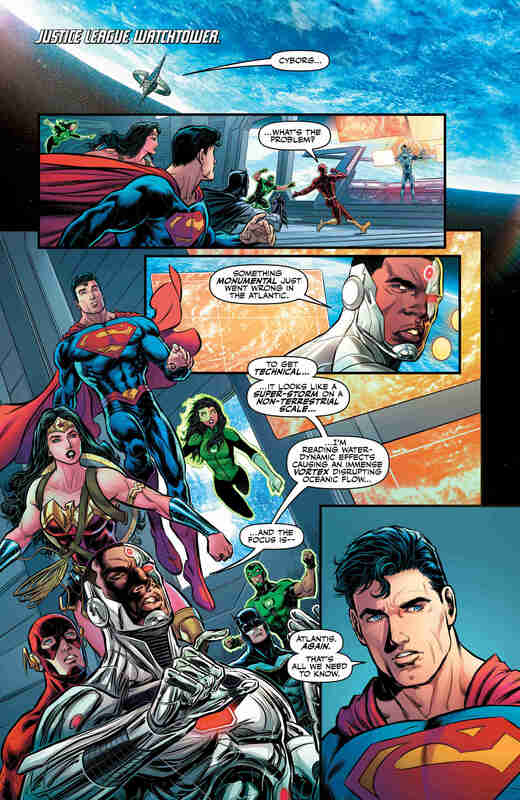 It really makes Abnett’s words – Superman’s speech about all of us being connected by the Earth around us – ring true. 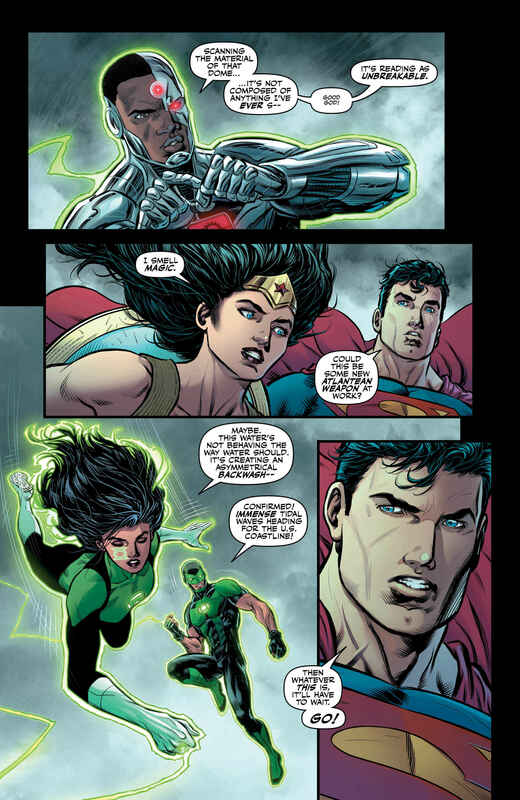 All in all, despite its connections to Aquaman, Justice League #24 can definitely be read on its own. It’s a very breezy, simple plot in the mold of the many, many ‘superheroes fight, superhero make up, superheroes team up’ stories we’ve read over the years. There’s nothing wrong with that classic structure, though, as in this case it does highlight an often overlooked character and brings an interesting new player onto the field. And it’s not too often that someone is able to take out the entire Justice League. On the other hand, it doesn’t do enough that feels new to really stand out too much. Still, if you are enjoying Abnett’s Aquaman, this is a must-read.